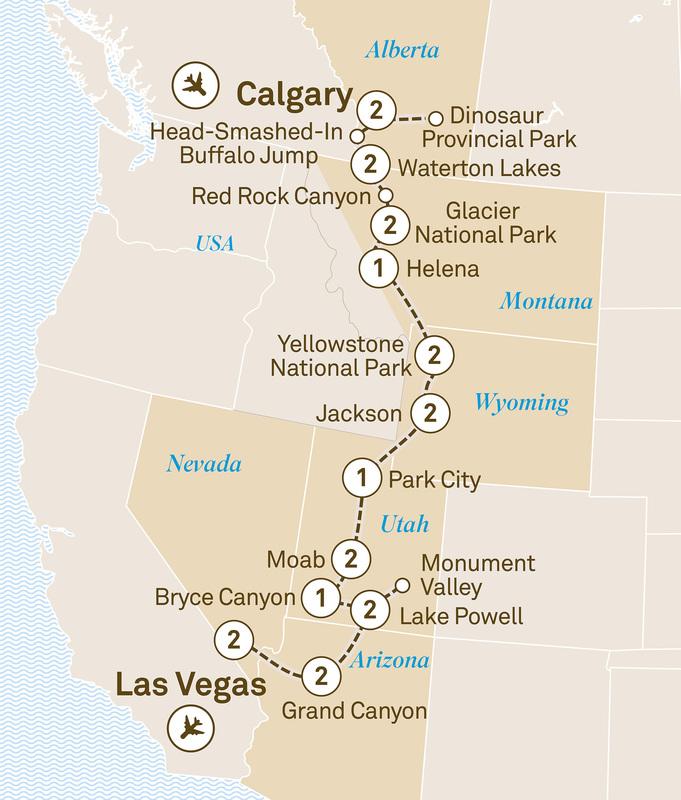 Travel from Calgary to Las Vegas on a 22 day tour discovering the best of America's National Parks including the Red Rock Canyon & Glacier National Park. It’s quite possible that everyone who has ever dreamed of travelling to North America has imagined being in one of the spectacular locations on this itinerary. Whether it’s riding in a jeep through the gigantic rock structures in Monument Valley, featured in so many classic westerns, or standing at the top of the cliff at Head-Smashed-In Buffalo Jump, there are so many iconic locations to discover. Walk among dinosaur bones, marvel at the spectacular volcanic pigments of Yellowstone National Park, view the inimitable Grand Canyon, one of the world’s Seven Natural Wonders or try your luck in Las Vegas. When you eventually do awake from this dream journey, it will be with a lingering sense of wonder. Your national park adventure begins with a two night stay at the Fairmont Palliser. Enjoy a welcome dinner this evening. Discover one of the world’s richest dinosaur fossil fields on a guided tour of this intriguing park. Journey to the World Heritage-listed Head-Smashed-In Buffalo Jump, the site of one of the most primitive yet sophisticated hunting techniques ever devised. Continue to Waterton Lakes National Park and keep a look out for black bears, grizzlies and other wildlife as you venture out to Red Rock Canyon. The next two nights, you’ll stay at The Bayshore Inn. Enjoy a morning at leisure before cruising through International Peace Park on the Canadian and American border. Visit Frank Slide Interpretive Centre which tells the story of Canada’s deadliest rock slide and provides a sensitive insight into life at the coal mining town before and after the disaster. Later, enter World Heritage-listed Glacier National Park. Stay two nights at Grouse Mountain Lodge or similar. Glacier National Park is home to glacial carved valleys, grizzly bears and golden eagles. Keep an eye out for these as you tour the region along the scenic routes. Delight in Helena’s gold rush history. Stay at the Helena Great Northern Hotel. Travel to Yellowstone, the world’s first national park and one of the most wondrous places on earth. Enjoy a two night stay in West Yellowstone. Discover the unique landscapes of Yellowstone on a guided tour and be awed by Old Faithful, the famous geyser that erupts with steaming columns of water creating a spectacular display. Explore Grand Teton National Park, virtually unchanged since prehistoric times. Stay in Jackson, the southern entrance to the park, at the Lodge at Jackson Hole for two nights. Today, be as active or as relaxed as you like. Relax in the alpine splendour of your overnight Special Stay at the Waldorf Astoria. Arches National Park is home to over 2,000 natural sandstone arches. Spend two nights at the Homewood Suites by Hilton Moab or similar. Visit Canyonlands National Park and marvel at the colourful canyons, tablelands, buttes, arches and spires carved by the Colorado River. Travel to Bryce Canyon and learn about the forces that create the incredible rock formations known as ‘hoodoos’. Stay at the Bryce Canyon Grand Hotel. Cruise down Lake Powell to experience the geological wonders. Stay at Lake Powell Resort in a marina view room for the next two nights. Explore the colossal natural wonders of Monument Valley on an exciting jeep safari. Carved over millions of years by the Colorado River, the Grand Canyon stretches 446km long and 29km wide. For the next two nights, stay at Yavapai East or Grand Canyon Squire Inn. As you stand before the Grand Canyon, it’s difficult to fathom its sheer enormity. Tonight, you’ll get to view this spectacular phenomenon as you dine on the rim. Cross the desert to the oasis of Las Vegas. You’ll end your journey on a truly luxurious note with a two night Special Stay at the Bellagio, in a fountain view room. Explore the sights at your leisure, then enjoy dinner with your fellow travellers. Cirque du Soleil’s ‘O’ is an aquatic masterpiece of surrealism and theatrical romance. Your wonderful journey ends today as you transfer to Las Vegas airport.